My family loves tacos. These are great summer tacos with a spicy grilled chicken filling. Simple, quick and tasty. I didn’t use radishes (because I am the only fan in the house) and substituted crunchy lettuce and cilantro instead. I also added sour cream to take away the spicy edge to the chicken; the chicken was actually not super spicy despite the chipotles. I toasted the hand-made whole wheat flour tortillas in a cast iron skillet for a few seconds on each side before topping with the filling. This recipe was adapted from Everyday Food. We ate them with refried beans and brown rice. They would be just as delicious- and more taco like- with corn tortillas. Stir together chipotles with cumin and salt. Add chicken and toss to coat. In another bowl, toss together sliced radishes or lettuce, cilantro leaves, and scallion greens. Dress with olive oil and lime juice; season with salt and pepper. 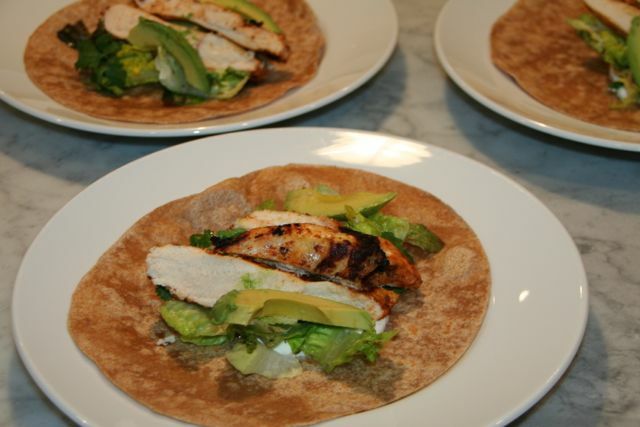 Serve on tortillas, topped with sour cream, avocado and dressed greens.